A book that brings to life the forgotten political debate that set America’s interventionist course in the world for the twentieth century and beyond. Kinzer’s The True Flag locates the origins of this anti-imperial tradition in the aftermath of the Spanish-American War, and argues for its continued relevance to public life today. One could not ask for a timelier argument ... Such was the birth of the American empire. As Kinzer shows, its advocates created a foreign policy at odds with national political tradition and with the supposed sanctity of such ideals as the consent of the governed ... The True Flag captures the tragic impact of American hubris at home and abroad. The anti-imperialists had correctly feared the effects of empire on American political life—the concentration of unchecked power in the executive branch, the corrosive impact of secrecy on public debate, the insulation of decision-making in unapproachable bureaucratic hierarchies. ...[a] lively and very readable reconstruction of one of American history's most consequential debates ... As a veteran newsman, Kinzer is particularly attuned to how national events play out in the public forum. His book is an assembly of contending voices —congressmen, editorial writers, the comic newspaper character Mr. Dooley. Sometimes, a dozen or more voices sound on a single page. The effect is sometimes choral rather than dramatic, but Kinzer maintains his narrative thread with a professional knack for compression and capsule summary ... Kinzer's subtitle, 'Theodore Roosevelt, Mark Twain, and the Birth of American Empire' is a bit misleading. Twain passed the early years of the debate in Europe and doesn't enter the story until Chapter 9 of Kinzer's 11 chapters ... Does the Constitution follow the flag? True Flag doesn't answer that question, but it vividly illustrates its endurance in American politics. Kinzer portrays both men as patriots, thinkers, and, in many cases, self-promoters. But while Roosevelt saw colonialism as 'Christian Charity,' Twain saw Christendom as 'a majestic matron in flowing robes drenched with blood' ... Indeed, the Roosevelt who emerges from these pages, like the one increasingly portrayed in American letters, is less the philosopher than the pugilist ... There are many fine elements in this book, including the delicious detail that Secretary of State John Hay was having an affair with Lodge’s wife as the two men were conferring on the Philippines treaty. 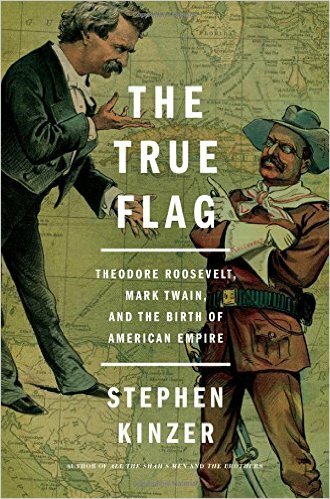 What did you think of The True Flag: Theodore Roosevelt, Mark Twain, and the Birth of American Empire?